Over the past few years, we have developed our panoramic photography skills, from being an add on to allow us to create the full colour laser scan records, using an Nikon D70 digital SLR through to interactive tours viewable on a variety of devices. We first looked at using panoramic imaging and photo stitching to assist with our 3D visualisation busniess back in 2003. Producing accurately rendered models and photomontages for various windfarm, chicken shed and landscaping projects required a lot of effort - photos taken on slide with a 50mm lens on an Nikon film SLR camera, processed, scanned and then stitched in Paintshop pro to create reference images. With some clever use of accurately modelled lenses in Mental Ray and Maya, we could then generate the correct scale and lighting conditions to give a fair resemblance of the project in question. Cwmorthin Uchaf, Cwmorthin, Blaenau Ffestiniog: An abandoned farmhouse with a rich history going back many centuries to before the large slate quarry that it sits next to. This has been recorded by the Cofio Cwmorthin project, a local history group doing excellent work in recording, researching and trying to stabilise the fascinating group of buildings that remain in the valley. Recorded using the 3D laser scanner and photography, we produced a pano tour and animated flythrough of the site. We also recorded some of the other buildings in the valley and were interviewed for S4C regarding the use of new technology and how it can help local history projects like this. For more information on this, see the videos on our Youtube channel. Casa de Corte, Ovasta, Tolmezzo, Italy: The same family have owned this house since the 16th century and it was recorded along with our Italian partners at Cramars, giving both a panoramic tour and animated flyaround of the site. Perillos, Fitou region, France: An ancient village being slowly re built by a volunteer team. Again, we laser scanned and produced a panoramic tour of the site and animated flyby. Cortijo el Paraiso, Andalucia, Spain: A traditional old farmhouse in the highlands of Andalucia. Again we produced a panoramic tour and animated flyaround. Bringing things more up to date, we've been busy recording various lead and other metal mines for the RCAHMW, Welsh Mines preservation trust and the Copper Coast Geopark. These have brought a new set of challenges, with the complexity of getting good imagery underground and in pitch black conditions taking a lot of experimenting. Flash photography isn't great for panoramic imagery due to the stark shadows and variation in lighting as the lens moves around, as well as difficulties in balancing lighting to minimise exposure issues in areas where you have one wall 0.5m away and the other maybe 40 or 50m away. We've built our own LED lighting rig to enable us to get accurate and consistent lighting and then we spend a good proportion of time working with HDR images to balance tonal range and exposures. Add on the challenges of water, mud and humidity in mines and it provides an interesting environment to work in. We now work with a Nikon D7100 24Mpixel DSLR and some 64Gb of image memory, allowing us to take hundreds of shots to build panoramas from bracket exposures. The thought of trying to do a project of the nature of Tankardstown mine using film and scanning is staggering - over £300 of film alone! 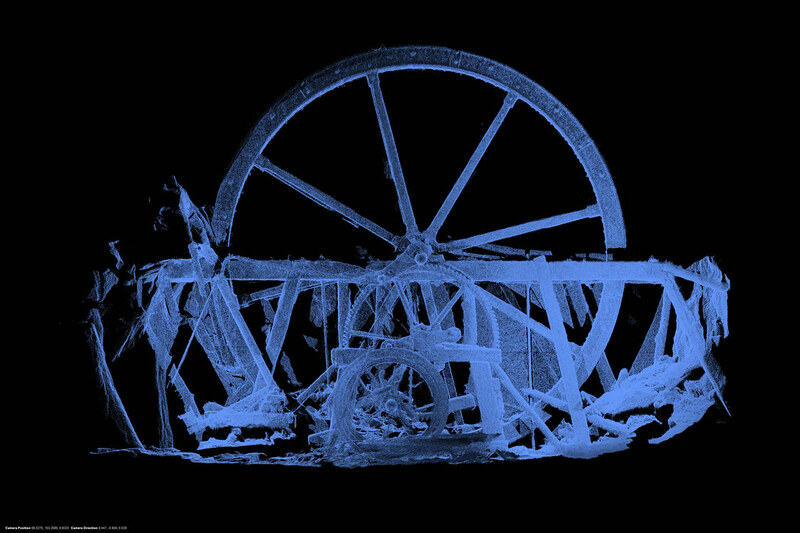 Underground waterwheel, Mid wales: A fairly unique project and our first attempt at taking underground panoramas, carried out as part of a survey for the RCAHMW. You can see the issues raised by using lights positioned away from the axis of the camera - here we were able to use generator powered floodlights, which were great for working under, but not so good for photography. We also produced an animated flythrough of the site. 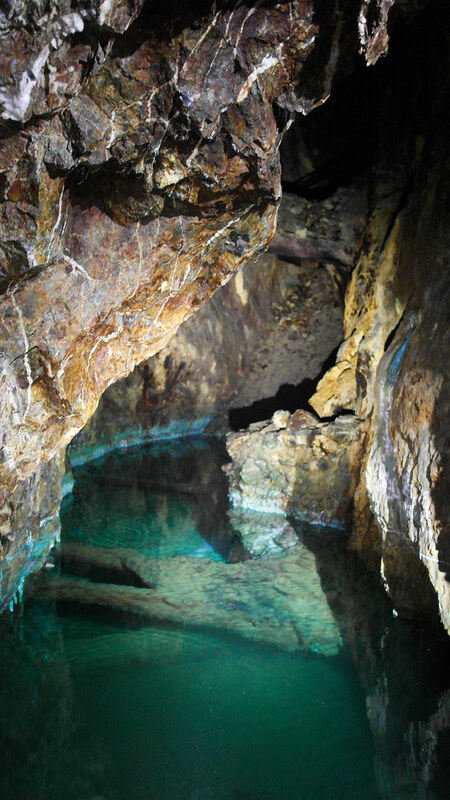 Cwmbyr lead mine, Mid Wales: Another lead mine, this time recording the surface works. Here we worked with Graham Levins of the Welsh Mines preservation Trust to record a panoramic tour of the site and use some of the excellent record images that they have gathered during their excavation of the site to show what's hidden under the current waste tips. 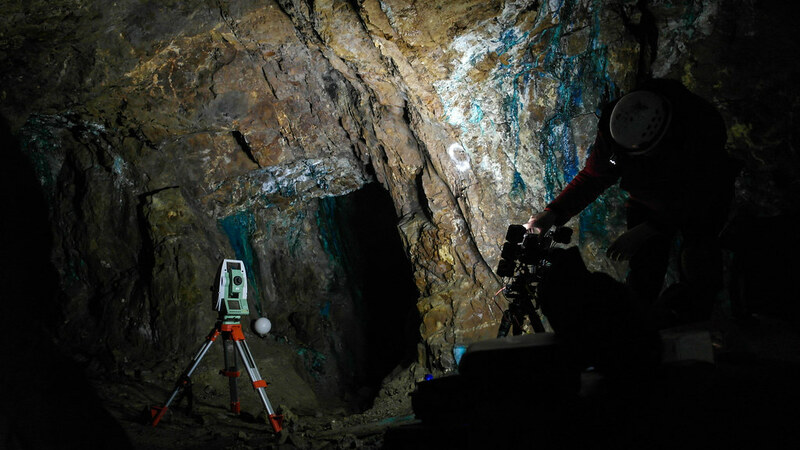 Temple Mine, Mid Wales: Recorded as part of the Metal Links project, this difficult to access wheelpit and series of mine adit entrances was laser scanned and photographed over two days to give a detailed record of a site that is in danger of collapse. Not suitable for public access, the pano tour and animated flythrough allow it to be seen on Youtube. Tankardstown mine, Copper Coast, Ireland: Recorded for the Metal Links and Copper Coast projects, this was our most complex project to date. The surface buildings were a straightforward 3D laser scan and panoramic tour, but the underground workings were a new set of challenges - dark, wet, humid and dangerous. 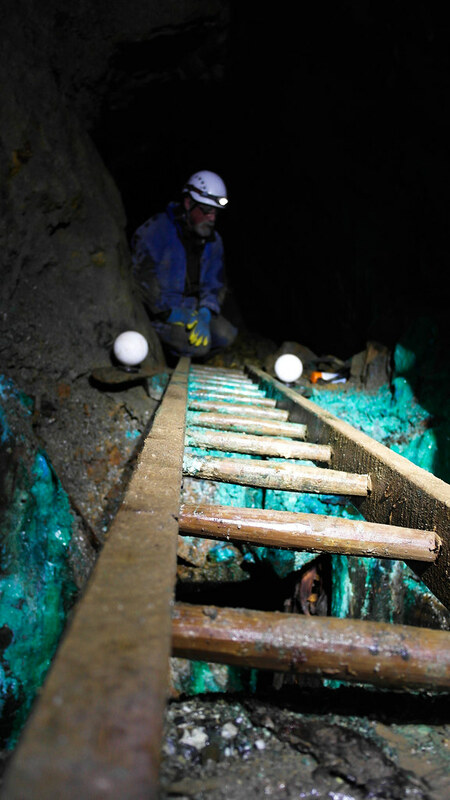 See our previous blog for the full story, but the panoramic photography required full use of exposure bracketing, HDR imaging, a compact LED light rig and careful control of backlighting to illuminate the amazing copper weeps and mining heritage. Luckily, while we were processing the thousands of photos we had from the mine, Kolor's Panotour Pro 2 came out, allowing us to put together what we feel is our best tour yet and making full use of HTML 5 to allow it to be viewed on a wide range of devices.